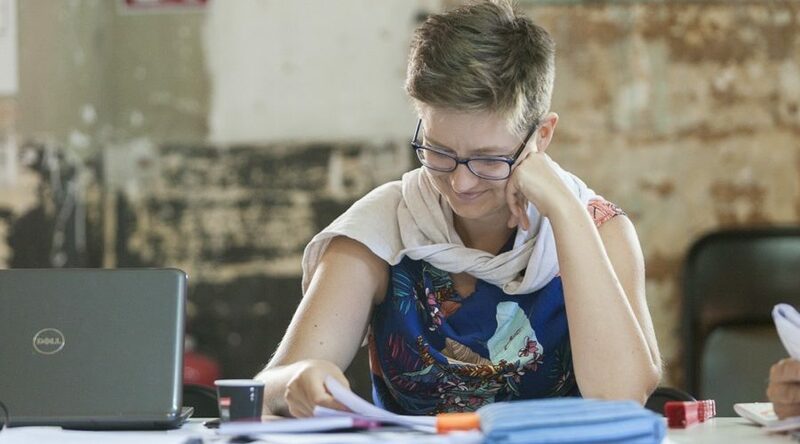 From 13th to 22nd July, the Polish playwright Anna Wakulik was hosted by Sala Beckett in Barcelona to hold a workshop and co-operate with the artists who were working on the stage presentation of her text A time to reap. I attended the residence organized by Sala Beckett between 13th and 22nd of July 2018. The core of it was: to lead a workshop focussed on the issue of humour and to co-operate with the artists who were preparing the staged reading of my play “A Time to Reap”. Moreover, the residency took place during the GREC, the summer festival in Barcelona: a wonderful, big theatre meeting point for artists from all over the world. There was a great atmosphere in Sala Beckett (which I believe concentrates the most important part of GREC’s activities dedicated to living playwrights). Each day I visited the theatre: it was full of working, writing, talking, saying hello to people from various countries. Sala Beckett designed a great, vivid summer school like a platform of exchange available to everyone who really wants to get there. Lunch time was the greatest lunchtime you can imagine on occasions like this: people talked about the most important subjects on the planet. And I believe they really did! I had also this feeling during my workshop: eight participants plus one cool translator, each age and attitude towards humour you can imagine, were the teacher’s dream group. The fear of having an ironic, not talkative, expected-to-BE-TEACHED group disappeared in about ten minutes. I had some tips for the writers which I normally use while writing, but I also wanted to explore with them what humour actually is, why we laugh, to give them materials, discuss and try to build some definitions and rules through working, reading, writing, analysing great pieces of writing. Such an openminded group is a treasure, really. People were listening to each other, talking openly about e.g. why they don’t buy Woody Allen’s humour, and I reached another goal I had besides giving them something: I took a lot from these conversations, which deepened my understanding of how humour works internationally (which was also a question which came to my mind because of reading Fabulamundi’s plays – that’s why I proposed this subject to Sala Beckett). The second pillar of my residency was a staged reading of my play. I got a couple of copies of it published in Catalan. I also went to the rehearsal room and I really enjoyed the passion of the actors and the director, whom I knew from previous conversations he had with me on the phone before we met in person. What touched me (and I’m saying nice words to me right now) is that this triangle I wrote about is such a readable human constellation in each culture. It doesn’t matter if it was being performed in London, Zagreb, Budapest or Poznan: it’s always close to the actors. Thank you, actors, for transporting it to the audience. These three people on stage were great. After the first night of showing it we had a great conversation with the audience and all the creative team led by Victor Munoz. It was also great to discuss the reading afterwards in non-formal situation: it was really refreshing to get to know what the audience got from it. I believe it is great to work. Don’t get me wrong, I’m not fooling anyone. I really do believe it’s great to be tired after traveling somewhere far away, seeing different faces, having something specific to do with people. But I also believe when writing and creativity starts is often in a spare time between the duties: at the airport, while walking home from a great Jan Fabre’s performance you wouldn’t have a chance to watch anywhere else. As a result, what I valued in this programme was also some free time I had to digest actually everything I experienced during the previous Fabulamundi’s year. And I did open a new file with some words said by people to another people in Barcelona. I’m taking it now to my vacations and I hope to fill it with the idea of a new, full play. Isn’t that the point of residencies?